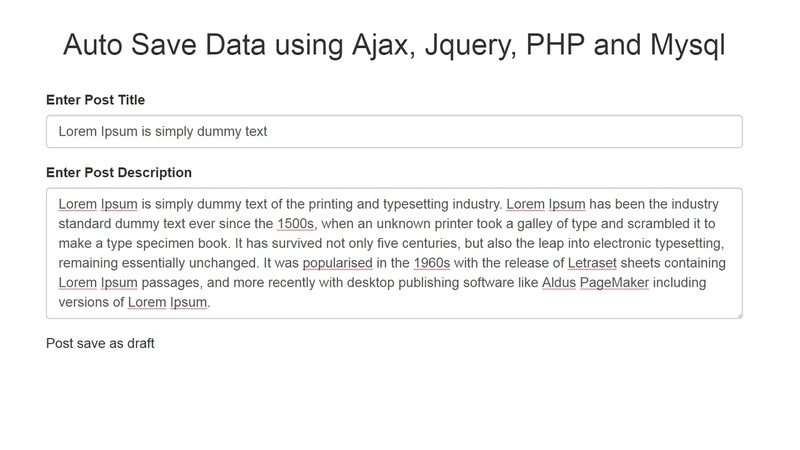 In this post we are going to learn how to save data automatically in database on specific time interval using Ajax Jquery with PHP and Mysql. This type of functionality you have seen into Wordpress Admin side if you have used Wordpress. If you have used Wordpress CMS, then at Admin side when we have create new post or page then after a specific interval of time it will save as draft our post or page automatically in Database. So our data will safe if we are forget to publish our content and we come after some time then our content will be placed in Database as draft. So, Tthis type of functionality we are going to learn into this post. In this post We will describe you a simple post example. In We have simple form for posting simple article with title and description. When user enter title and description thenafter some time interval post automatically insert into database table. This things happends only after user enter post title and description. In this tutorial if post enter for first time then it insert into database table but if post already inserted then it will update that post data on regular time interval. Thank you for sharing; it’s nice and helpful information. I hope I could read more information like this in the next visit. Getting HTTP 404 error. Looks like ajax can not find the php file. Index.php and save_post.php has to be in the same theme folder?